Help reduce labor costs and improve productivity and worker well being. Ergonomic and comfortable—waist and chest straps on backpack help keep weight off shoulders and onto hips. Large 3" opening makes refilling clean and easy. 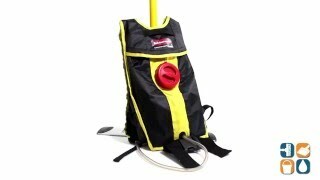 Holds up to 1.5 gallons for finishing up to 3,000 sq. ft. Works with all floor finishes. Application: Floors; Mop Head Size: 18" Wide; Handle Length: 56".